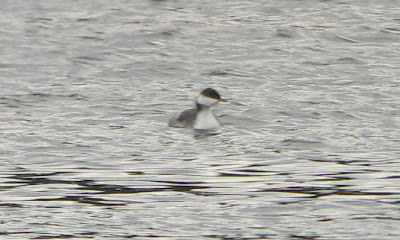 Horned Grebe. 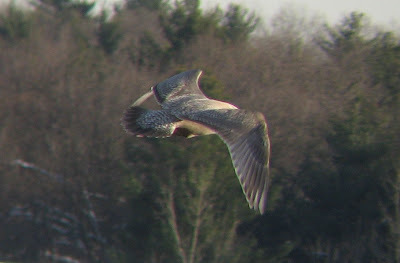 Barton Cove/Turner's Falls, Franklin County, MA. Dec 29th. 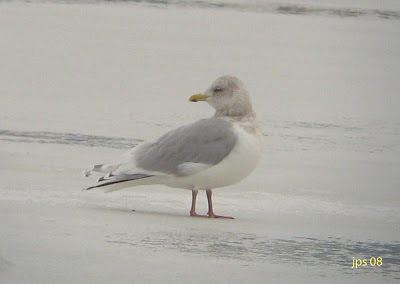 Another run up to Turner's Falls to look at the gulls. 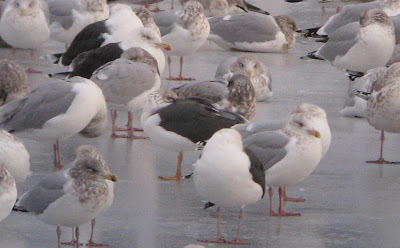 Ice conditions looked perfect for viewing roosting birds from Riverview Drive in Gill but sadly the main mass of birds didn't arrive until quite late (after 4:25 pm). 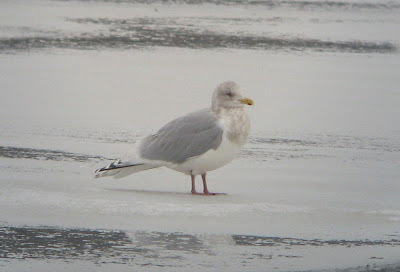 Even so, I did have close views of 2 adult Lesser Black-backed Gulls, a first-cycle Kumlien's Iceland Gull and more distant views of what I think may have been a first-cycle Nelson's Gull (Glaucous x American Herring Gull hybrid). 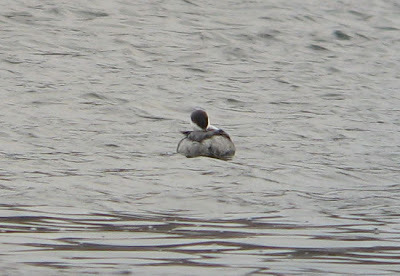 Slightly more surprising was a Horned Grebe just off Riverview Drive. 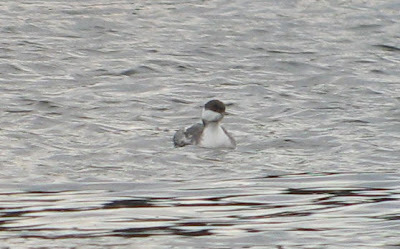 I say surprising because I'm really not sure that I've seen Horned Grebe at Turner's Falls/Barton Cove. 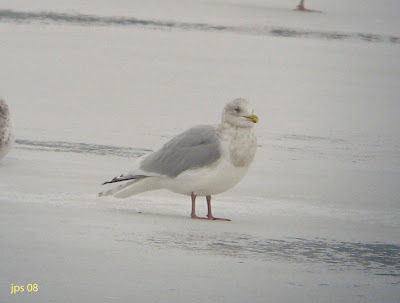 Virtually all my local sightings of this species have come from the Quabbin Reservoir usually during fall migration and I don't recall ever seeing one on CT River before today. 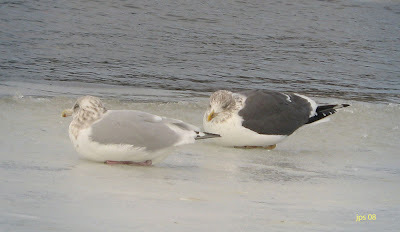 Lesser Black-backed Gulls - two images showing two different adults, this sleeping bird having much brighter yellowish legs than the other. 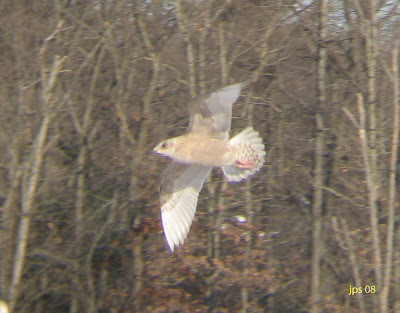 Kumlien's Iceland Gull - non-breeding adult, Turner's Falls, Franklin County. December 24th. 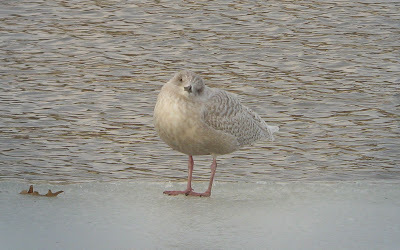 A quick run up to Turner's Falls this afternoon produced this really fine adult Kumlien's Iceland Gull resting on the ice close to Unity Park, the first adult that I've seen here this winter. 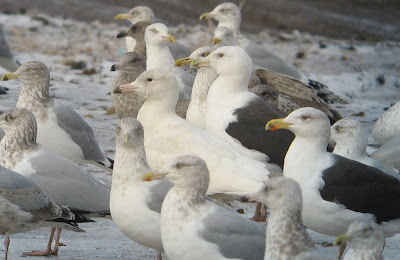 It's good to know that within this relatively small gull roost new birds are still turning up. 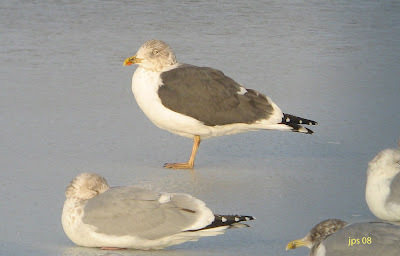 Also present, about 300 gulls in total including a first-cycle Kumlien's Iceland and an adult/sub-adult Lesser Black-backed Gull. 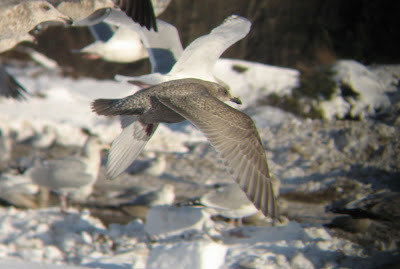 Thayer's Gull - first-cycle, Windsor/Bloomfield Landfill, Hartford County, CT. Dec 23rd. Found by Nick Bonomo with Julian Hough. Potentially about the fifth state record. Made a another visit to the Windsor/Bloomfield Landfill this afternoon having made tentative arrangements to meet up with Nick Bonomo and Julian Hough the night before. Conditions felt good on arrival. Nice and calm, though perhaps a little too bright and sunny for optimum viewing. Much to my delight, Nick and Julian had already seen some fine birds in the hour before I'd arrived. 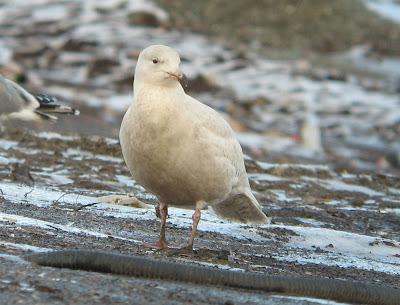 This fine first-cycle Thayer's Gull was certainly the highlight, but a stunning adult Glaucous Gull came in a close second. 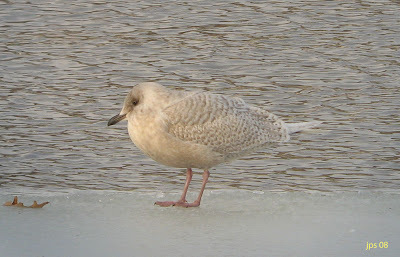 Also present, at least five Kumlien's Iceland Gulls (including one adult), a Northern Harrier, and then later in the day, Common Raven and Pine Siskin. 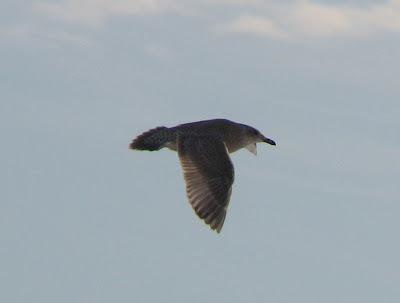 The Thayer's was an amazing bird and a great learning experience. 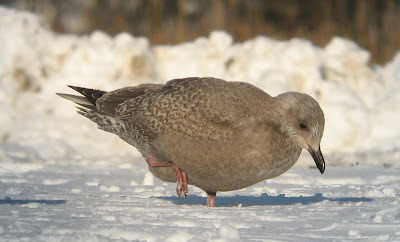 At times it looked VERY like a first-cycle American Herring Gull, especially in harsh light. 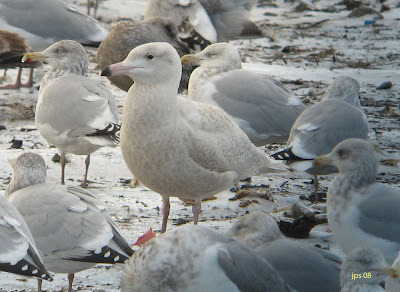 In softer light with high cloud cover, it's appearance changed to that of a more readily identifiable Thayer's when its plumage looked more 'frosty' and less contrasty. 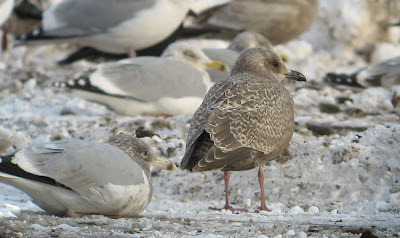 By late afternoon with near complete cloud cover, it wasn't too difficult to pick out of the numerous young American Herring Gulls present. I'll be adding more annotations to these images over the next few days when I have a little more time. 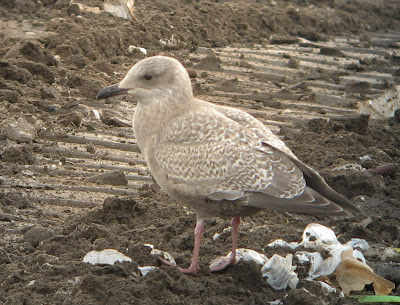 But....full credit to Nick Bonomo for another superb find at this landfill, and thanks very much to Julian and Nick for the fruitful and lively discussion over the bird in the field. It was a really fine opportunity to study an out-of-range Thayer's at close quarters. 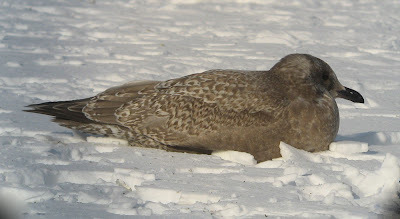 Nick has a fine collection of images and field notes on his own blog @ Shorebirder. 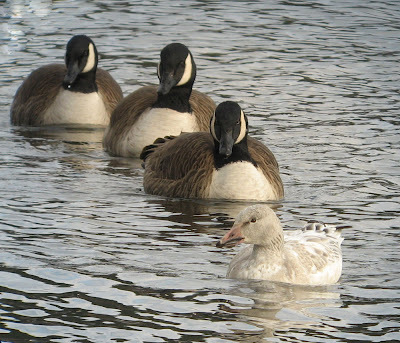 Snow Goose - immature with Canada Geese, Turner's Falls power canal, Franklin County. Dec 22nd. No sign of the Little Gull today, despite a fairly extensive vigil carried out by many of the visiting birders that I bumped into, some of which had even tried being at the gull roost for first light! 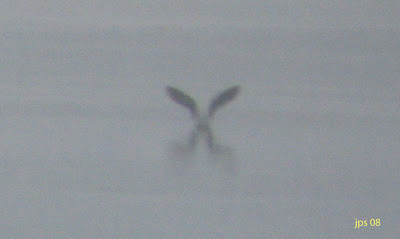 I'd guess that the Little Gull departed on the clearing skies which developed overnight and is unlikely to be seen again. Let's hope I'm proved wrong. 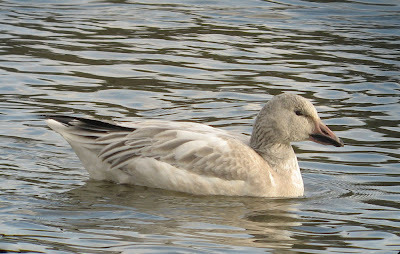 Cold, raw and blustery today with temperatures barely breaking 20 deg F. Generally it was pretty quiet in the Turner's Falls area but 2 immature Snow Geese on the power canal was rather nice, as were close Kumlien's Iceland and Lesser Black-backed Gulls just off Unity Park. 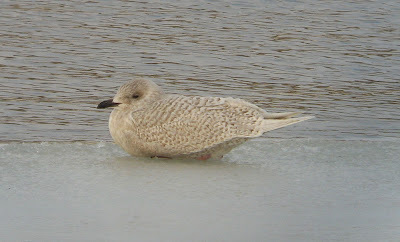 Another Kumlien's Iceland Gull was present on the power canal. 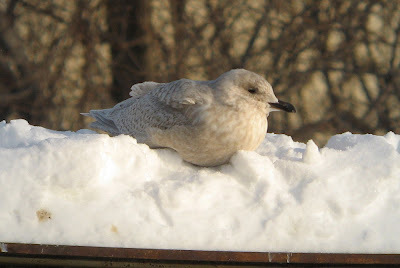 Kumlien's Iceland Gull - first-cycle, Turner's Falls power canal, Dec 22nd. 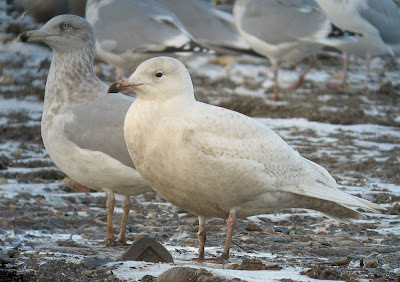 Kumlien's Iceland Gull - first-cycle, Turner's Falls, Barton Cove, Dec 22nd. 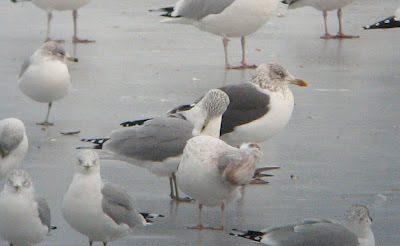 Lesser Black-backed Gull - L.f. graellsii, adult, Turner's Falls, Barton Cove, Dec 22nd. 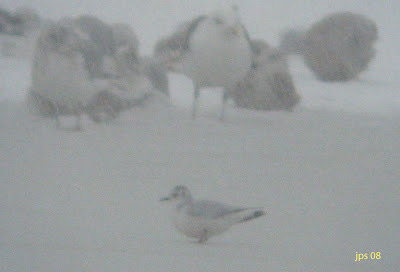 Little Gull - non-breeding adult in snow storm, Barton Cove, Gill, Franklin County. Dec 21st. 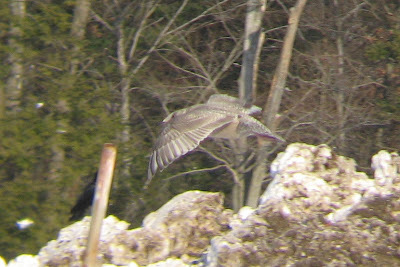 The rosy suffusion on the underparts was apparent in the field, but I am surprised that the camera picked up the color tone in awful visibility. 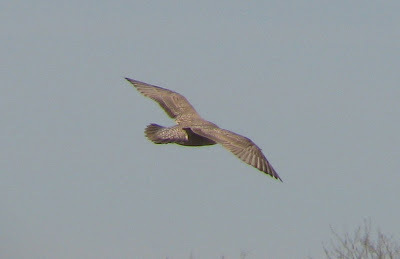 Although I saw the bird in flight a couple of times, this was the best that I could come up with for an underwing shot. 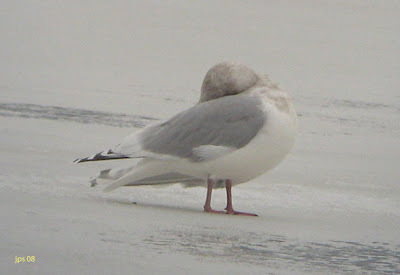 It does, however, show the uniformly dark smoky-gray underwings and rather rounded wing tips, typical of adult Little Gull. 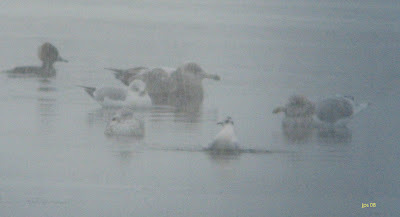 Interesting size comparison between Little Gull and other species of gull. 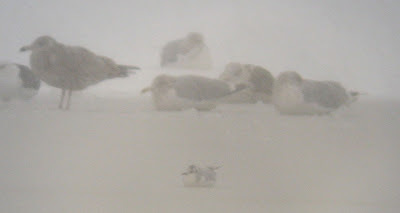 The two birds to the left of the Little Gull are Ring-billed Gulls! 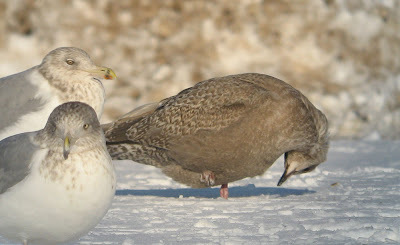 Again, a nice size comparison betweem Ring-billed (left) and American Herring Gulls (rear and right). 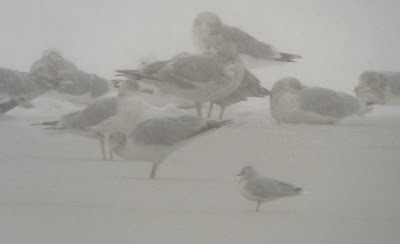 Winter storms bringing almost continuous snow since noon on Friday, really had me itching me to get out and check the gulls at Turner's Falls late this afternoon. Conditions were horrendous on the roads getting out there and visibility appalling once I'd arrived. 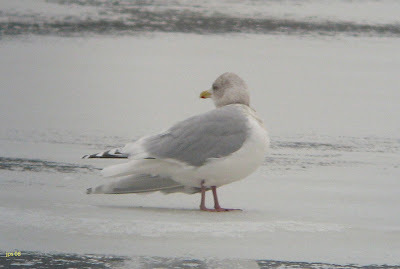 Fortunately, the handful of gulls present and roosting on the ice were very close to the road on Riverview Drive on the Gill side of the river. I'd expected to see more birds. 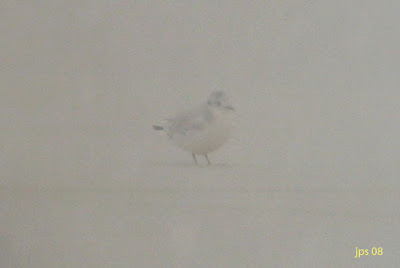 There were probably less than 100 gulls present, but the highlight came as a complete surprise - an adult Little Gull! 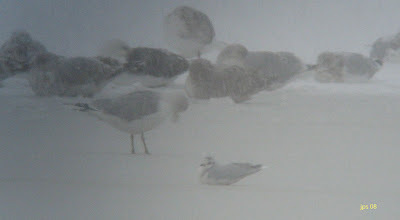 The record shots are the best that I could get in the blizzard and fading light. 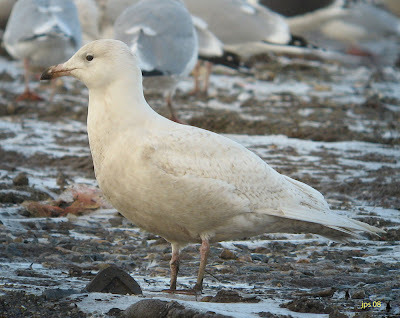 Having made just one call to Scott Surner, the 'grapevine' seemed to work well and allow Mark Fairbrother to get out and see the bird before darkness set in. 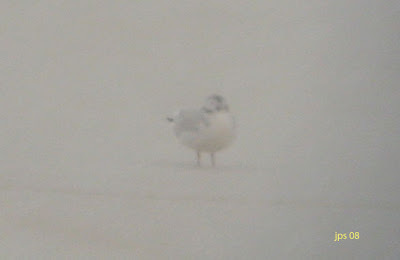 Although not a state rarity, it would appear that Little Gulls are absolutely exceptional in interior Massachusetts. 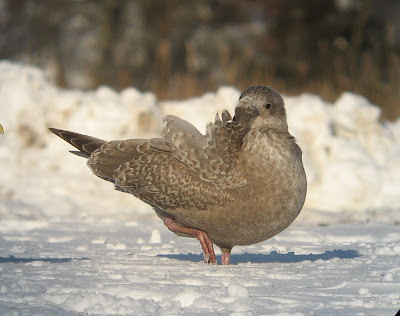 I can only find one inland record, a second-cycle bird at Lake Onota, Pittsfield, Berkshire County, April 20th - 21st, 1946 (Griscom). I'd certainly be interested to know of any other reports from interior MA or any records along the Connecticut River Valley? 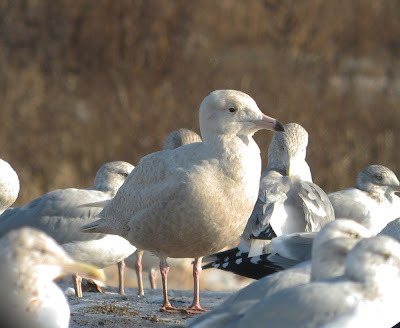 Glaucous Gull #1 - Windsor/Bloomfield Landfill. Dec 18th. 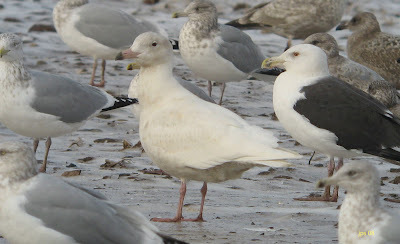 Nick Bonomo and I spent a good four hours at the Windsor/Bloomfield Landfill in Connecticut sorting through the gulls and hoping for something unusual. We were joined for a brief time by Brian Kleinman. 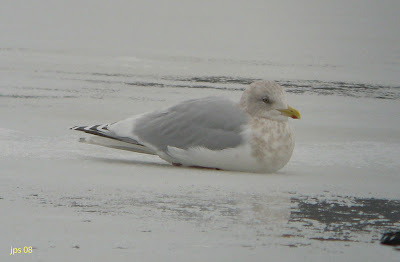 At peak some 5,000 large gulls must have been present but we couldn't come up with anything truly 'mega'. 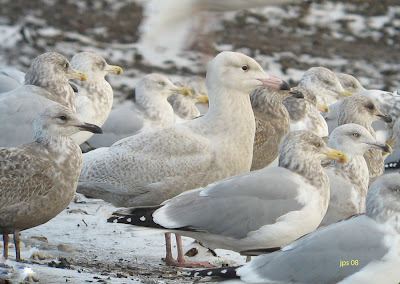 Of the scarcer species, three Glaucous Gulls were the highlight, all of which gave excellent views throughout much of our stay. 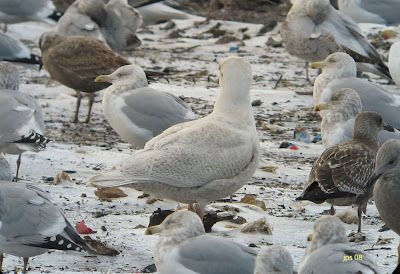 Also present, 2 Kumlien's Iceland Gulls (1st and 2nd cycle), an adult Lesser Black-backed Gull and 1 Ring-billed Gull. 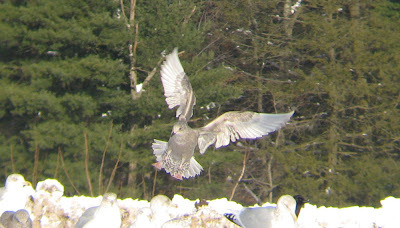 Glaucous Gull #1 - one of three first-cycle birds Windsor/Bloomfield Landfill. Dec 18th. 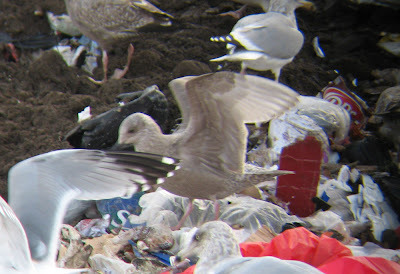 Glaucous Gull #2 - the second of three first-cycle birds, Windsor/Bloomfield Landfill. Dec 18th. 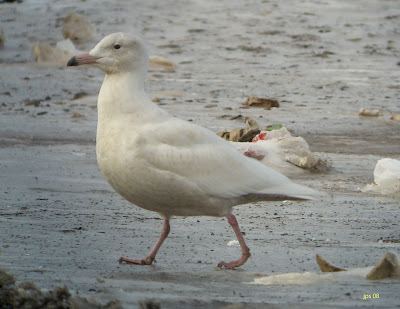 Glaucous Gull #3 - the third and smallest of three first-cycle birds present, Windsor/Bloomfield Landfill. Dec 18th.